Media and Contents: 333 parts (316 in olive drab styrene, 10 clear styrene, 4 vinyl keepers, 2 vinyl track runs, 1 section of nylon string). Disadvantages: Took more than 30 years to come out! Most WWII fans are aware of what the M10 tank destroyer - actually the M10 3" Gun Motor Carriage in official literature - was and how it came to be. While many other countries (Germany, the USSR, Italy, and Japan being the major ones) preferred to use tank destroyer vehicles with either open or closed casemate mountings of large guns on smaller vehicles, after some experimentation the US took the medium tank chassis in production, fitted it with a thinly armored sloped upper hull, and then a revolving turret with what was then the most powerful medium caliber gun in US service, the 3" antitank gun. But they found out soon after it was fielded the new gun woefully unbalanced the turret and as a result balance counterweights had to be slung on the back of the turret to provide for rapid and smooth traversing of the gun on all terrain. After an experiment with two rectangular weights, a prism-shaped counterweight was developed that gave the vehicle what became its familiar silhouette. Late models were redesigned to give a “duck tail” look to the weights. Between June 1942 and December 1943 4,993 M10 vehicles were built, all with the power plant from the M4A2 diesel tank; this made it one of the very few diesel powered vehicles to operate in US Army service during WWII. These were joined by 1,731 M10A1 versions fitted with the power plant of the M4A3 (Ford GAA engine). They were shared with the French and Commonwealth forces, but the latter regunned a number of vehicles with their more potent 17-pdr gun. A later follow-on, based on the M10A1, became the M36 90mm Gun Motor Carriage. 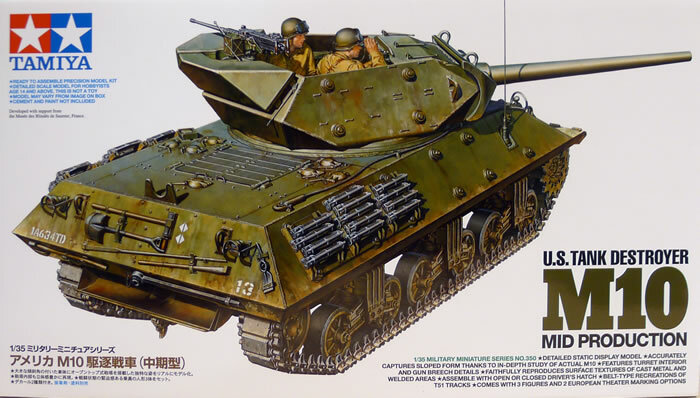 Tamiya first came out with a kit of the M36 in the late 1960s and followed it in the 1970s with one of the M10. Both kits had overscale hulls, and the early M36s were based on post-war ROK vehicles retrofitted with a bow machine gun. Details were poor, tracks were awful, and the only good thing to be said about the M10 is that it had a nearly 1/35 scale turret shell that was useful if you wanted to use it as the basis for a scratchbuilt conversion of an M4 kit. Roughly 16 years ago both Academy and AFV Club released new mold kits of the M10 with complete frontal section interiors, but both had some serious problems. The Academy turret shapes were way off and the AFV Club one had some dimensional problems. Over the years Tamiya has let the problem fester by continually re-releasing their 1970s vintage kit. When this kit was announced, it was met by eye rolls and yawns up to the point where it made its appearance as a totally new kit with all parts nearly new from the ground up. And it is a spectacular kit. There have already been some “rivet counter” reviews that fault the kit for minor errors here and there, but those people need to keep in mind this is a model kit and some compromises DO have to be made to mold a model that can be easily assembled. Checking the kit against photos and plans that I have show nearly all of the angles match within reasonable limits and the shapes are correct, especially the turret which now is wide where it should be and narrow where it should be! This kit reflects the new build philosophy of Tamiya that is patterned to some degree on the Tasca/Asuka kits in its parts layout and breakdown. The hull is built up from belly, stern, side, firewall and sponson floor sections, with the turret floor module being the main aligning feature for hull assembly. The hull rear section includes the radiators and mounts the “Siamesed” mufflers of the GMC diesel engines. The bow has a “softnose” one-piece transmission cover. Road wheels are the “pressed/welded” type mounting on bogies with the “flat” return roller mount with lift blocks. However, the idler is also a “pressed/welded” type which is wrong for most of the M10s I have photos of; it should have the “welded” spoke type. (Not a problem for any fan of Shermans.) Tracks have a two-pad overlap so one can easily be removed for a tighter fit if necessary. Some details are quite clever. The hatch hinges mount from inside the upper hull and look the part. There is also a geared ring for the turret race that is fitted from the inside. Sponsons are provided with two sets of ammunition stowed in tubes as one-piece affairs (not a bad idea as it makes them easier to paint and install and they are hard to see with the turret in place. No driver’s compartment is provided however. Note that the sponson floors are fitted to the upper hull and then the side flares/skirts are attached to them; tabs and ribs put them into alignment. While like all other M10 kits before it the model does not come with applique armor, it comes with separate bosses for that armor that are attached to the upper hull along with the grouser racks and grousers. The model stows a total of 26 grousers in six groups. Fuel and filler caps are separate parts as well. The hatches are provided with clear styrene periscopes and may be installed open or closed as the modeler chooses. Oddly enough the tools still seem to avoid stowage straps, odd after all of these years. The figures provide a gunner, loader and commander, all standing in the turret area. Clear styrene goggles are also provided for two figures, here the loader and commander. The M2HB is a stock Tamiya sprue seen in other kits but is still a serviceable weapon. The tow cable is nylon string so some modelers will wish to replace it with twisted wire. Two finishing options are provided, both in olive drab: 634th Tank Destroyer Battalion, attached to 1st Infantry Division, Aachen, Germany October 1944 (single circled white star on glacis, bumper codes, vehicle number 13); 601st Tank Destroyer Battalion, 3rd Infantry Division, Southern France August 1944 (circled white stars in five locations, white panels with black 3 1 on rear of turret counterweights). A small sheet of decals is provided; the 634th vehicles are shown on page 372 of the Hunnicutt “Sherman” book for those wanting to replicate them better. In summary, Tamiya has produced a winner, but given the “lived-in” look of most M10s it begs for stowage and alternate fittings. But is a great “blank canvas” to start with!